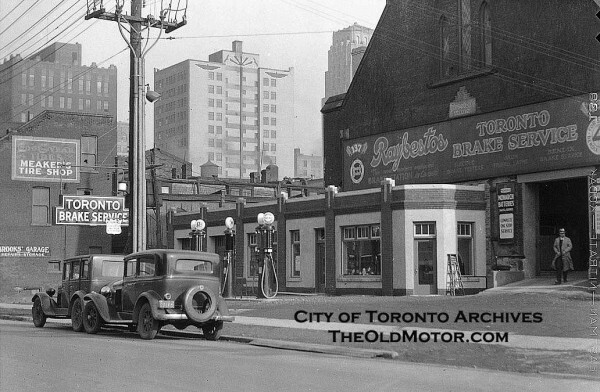 Here are a couple of interesting gasoline alley photos, that are circa 1930 and taken in the city of Toronto, Canada. In the photo (above) are signs for; The Brooks Garage, Meakers Tire Shop and the Toronto Brake Service and gasoline station. The Canadian Engineer reported in 1932 about the building above: The old church building at 137 Richmond St. West, now occupied by the Toronto Brake Service, is being demolished to make way for a modernly equipped brake service and gasoline station. A British American Gasoline station is seen (below) with bevy of nine visible gas pumps, around a station with Tudor revival style architecture. In addition to selling gasoline it appears that the the station may have had three service bays. On the right side of the photo is an attractive 1929 Buick Roadster. If any of our readers can add any information about either photo, what is there today or the automobiles, please send us a comment. Both of these photos are courtesy of the City of Toronto Archives. You can see hundreds of other gasoline station photos (scroll down) here on The Old Motor. 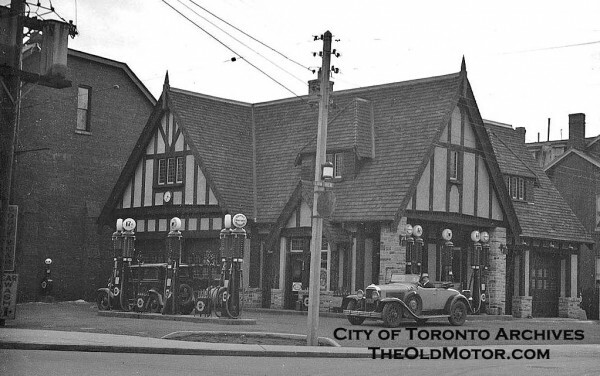 This entry was posted in Auto photos 1921 - 1942, Garages and Dealerships, Gasoline stations and tagged 1929 Buick Roadster, British American Gasoline station, Garages, Gas stations, gasoline alley photos, Toronto Brake Service. The tenth gas pump is partially hidden behind the brick pillar. Omar thanks for checking….Look again, as that is what we originally thought. Two of the three pumps on the right have double glass-containers. posted for Spike: I had one of those gas pumps, which are called canadian doubles and they are two 10 gal glass tubes with the gallons are etched into the glass….nice pumps.